Fluticasone propionate was discontinued, resulting in significant improvement at 2-week follow-up. A case presented at the American Thoracic Society (ATS) 2017 International Conference and published in the ATS Journals describes a rare instance of inhaled corticosteroid-induced myopathy due to fluticasone propionate taken with ritonavir. The patient was a 58-year-old man with HIV, chronic obstructive pulmonary disease (COPD), hepatitis C, and a history of IV drug use who presented to the hospital with bilateral lower extremity weakness and a number of falls over 3 months. 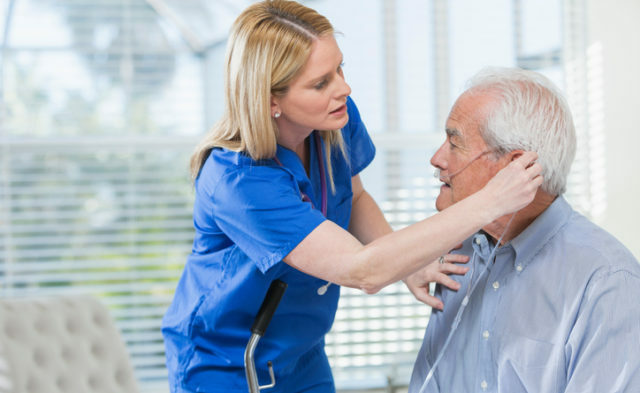 The patient’s medications included lopinavir, ritonavir, efavirenz, and lamivudine in addition to inhaled fluticasone propionate and bronchodilators for his COPD. Upon examination, the patient had truncal obesity, significant reduction in the strength of bilateral hip flexion and shoulder abduction with “relatively preserved distal motor strength;” his deep tendon reflexes and sensory exam were not remarkable. His blood count, metabolic and liver profile, thyroid test, and cortisol levels were all normal; creatinine kinase was reportedly 39 IU/L. Initially, the team attributed the muscle weakness to either HIV or drug-mediated myopathy but a muscle biopsy later revealed atrophy of type II fibers without necrosis or inflammation — indicative of a steroid-induced myopathy. The patient’s inhaled fluticasone propionate was discontinued and antiretroviral therapy was resumed. At a follow-up appointment 2 weeks later, the patient demonstrated significant improvement. Myopathy due to inhaled corticosteroids is a rare occurrence though it is an established adverse effect of systemic corticosteroids. The authors believe that the potent CYP3A inhibiting effect of ritonavir decreased fluticasone’s first pass metabolism and caused systemic toxicity manifested as myopathy. How Does CVD Comorbidity Influence Bronchodilator Tx in COPD? Does ICU Volume Impact Mortality and Length of Stay in ARDS?